Signed with the monogram 'VS' in the border of the plate. Virgil Solis. Emperor Nero. 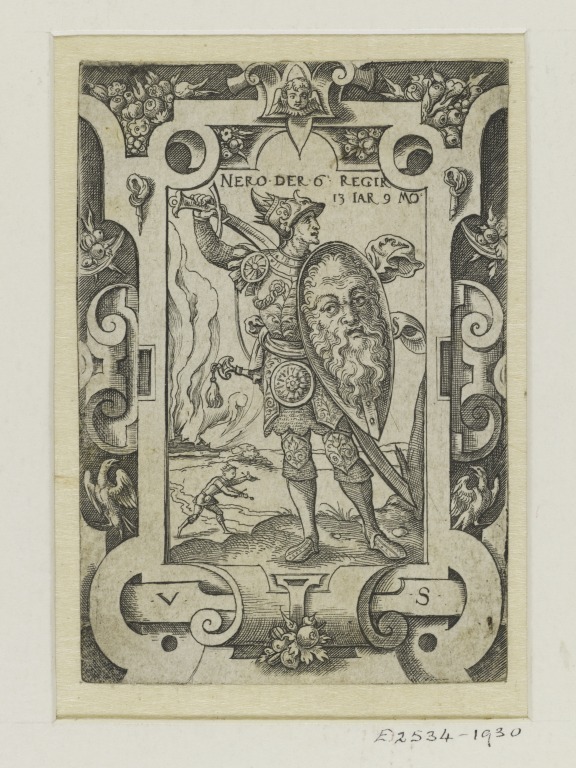 Plate from a suite of 12 representing Roman Emperors within a strapwork border. Nuremberg, 1530-1560.
de Jong, M. and de Groot, I., Ornamentprenten in het Rijksprentenkabinet I, 15de & 16de eeuw, ‘s-Gravenhage, 1988, no. 456.5. Peters, Jane S., ed. The Illustrated Bartsch, 19 (Part 1). 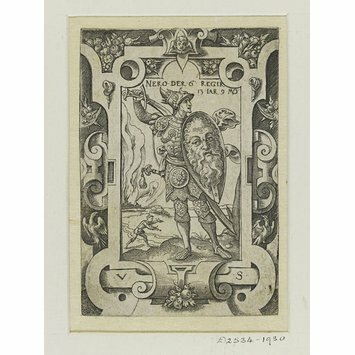 German masters of the sixteenth century: Virgil Solis: Intaglio Prints and Woodcuts. New York: Abaris Books, 1985. No. 77.